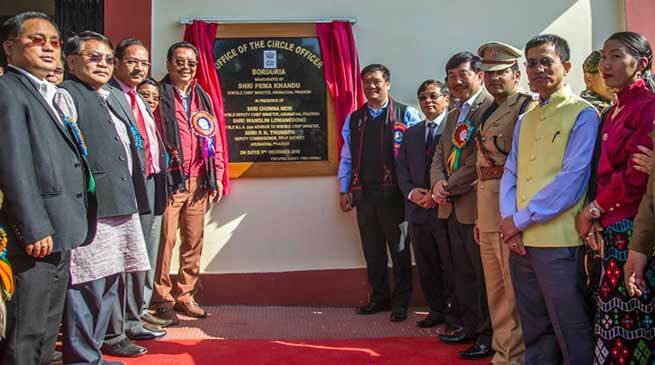 Arunachal Pradesh CM Pema Khandu reached Borduria on the second day of Arunachal Rising campaign, inaugurated Borduria circle office. Chief Minister Pema Khandu today began his second day of Arunachal Rising campaign here accompanied by DCM Chowna Mein, Advisor to CM Wanglin Lowangdong, DoTCL Minister Wangki Lowang, MLA Wanglam Sawin and State BJP President Tapir Gao. Chief Minister on his arrival at Borduria circle paid homage to Ashok Chakra late Havildar Hangpan Dada in his Memorial here. He also met late Dada’s wife Chasen Lowang and had discussion with the Army officers for development of Memorial. Chief Minister requested Tirap DC to submit a DPR for work on Memorial and assured Rs 2 crore as initial fund to start the work in this financial year. Chief Minister later inaugurated the office of the Circle office while DCM inaugurated the Inspection Bungalow. Attending a public meeting, Khandu congratulated the people of Borduria circle for the new CO office. He said if people demand then the state government is willing to upgrade the Borduria Circle to Sub-Division headquarters. Responding to public memorandum, Chief Minister assured for establishment of Circle Office at Longo, construction of Tirap Chief Council Office and construction of 21 km Joypur-Hukanjari road. Khandu said Tirap Changlang Longding region has been deprived under central scheme and asserted that the present government is ensuring that further deprivation do not continue. He informed that 21 km Terung to Sumsi pathar has been approved under central scheme for Rs 20 crore. On Sainik School, Chief Minister promised to start one for eastern Arunachal in the next session and assured to establish it in the TCL region. Launching the Arunachal Rising campaign, Chief Minister gave away cash prizes and certificates to best ASHA workers, Anganwadi workers and progressive farmers from Borduria circle. He also distributed blankets to gaon burahs of the circle. On the occasion DCM Chowna Mein, Advisor to CM Wanglin Lowangdong and State BJP President also spoke.